Twenty-one humanitarian and human rights organisations today called on all parties to the conflict in Syria to “immediately end the use of explosive weapons with wide-area effects in populated areas, including but not limited to barrel bombs, mortars and other heavy weaponry”. This was one of the recommendations of ‘Failing Syria: Assessing the Impact of UN Security Council Resolutions in Protecting and Assisting Civilians in Syria‘. The report highlights multiple shortcomings in the implementation of measures intended to improve the situation of people living through the conflict. Actions on humanitarian access, civilian protection, and increasing aid have been “ignored or undermined by the parties to the conflict” and other states, according to the agencies releasing the report. They include Handicap International, Oxfam and Save the Children. A stark deterioration in the protection of civilians living through the armed conflict is reported in ‘Failing Syria’. Its authors note that “the use of explosive weapons, responsible for 53% of civilian deaths since 2011, has worsened in 2014“. 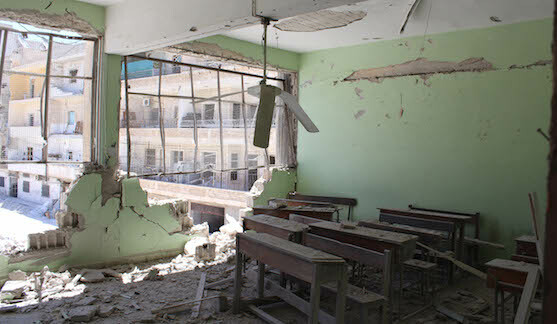 Explosive weapons used in populated areas have caused death, injury, disability and the destruction of civilian property and infrastructure over the course of the conflict in Syria. The report notes documentation by the Commission of Inquiry on Syria of indiscriminate shelling by armed opposition groups. It also draws attention to the increased use of improvised ‘barrel bombs‘ in densely populated areas by Syrian government forces throughout 2014, which the UN Secretary-General has consistently condemned. Conflict parties are clearly and evidently failing to observe UN Security Council Resolution 2139, which “demands that all parties immediately cease all attacks against civilians, as well as the indiscriminate employment of weapons in populated areas, including shelling and aerial bombardment, such as the use of barrel bombs”. ‘Failing Syria’ demands that “practical steps must be taken as a matter of urgency”. The use of explosive weapons with wide-area effects in populated areas, whether targeted illegally at civilians or at military objectives, causes severe humanitarian harm in Syria and other countries in conflict. It must end.